For those in search of paradise, there are enough islands surrounding Koh Samui to satisfy the most demanding of travellers. 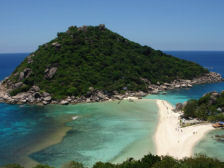 Koh Pha Ngan, famed for it's unspoilt beaches and full moon parties, Koh Tao, for serious divers and those in search of more seclusion to the myriad islands in the Ang Thong National Park. Once the haunt of sea-turtles, this small island north of Koh Samui with its quiet undisturbed beaches has become a magnet for divers with the clarity of the waters and the expanse of the stunning coral reefs. Although not offering the action of Koh Samui, for those who really want to get away from it all, this island is hard to beat. Old bungalows of the past have now been joined by new resorts with 24 hour air-conditioning and better facilities. In spite of this, the island still remains a beautiful and unspoilt paradise.